Sept. 29, The Asahi　Shimbun – abridged and approximate translation –　Two women, one aged 81 and the other 18, are playing in a same team. Women’s baseball is reemerging as a popular sport in Japan. This is a story of friendship through baseball between the two women who are 63 years apart in age. 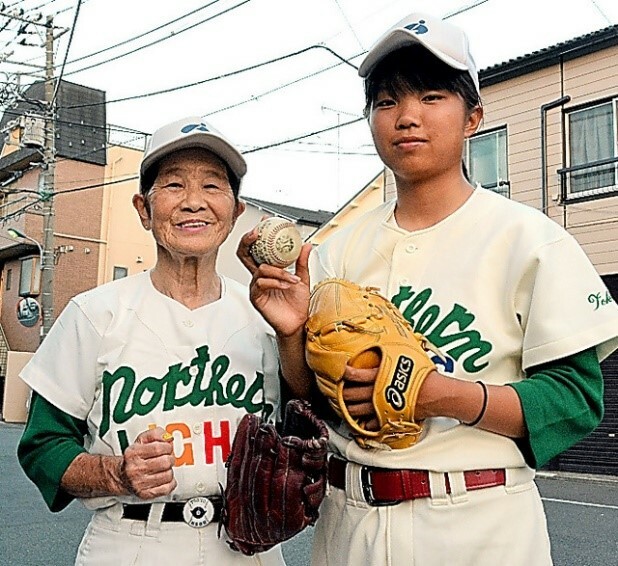 “Northern Lights”, a rubber baseball team in Kita City of Tokyo Metropolis (Kita means North), Manager Machiko Takahashi (81) gets a pitch of Mizuki Kanda (18). Mizuki, 167 cm tall, is a pitcher/outfielder of Kamata Women’s High School hardball baseball team and throws 110+ speed. Manager Takahashi played infield at Wakamoto Pharmaceutical Company which was dissolved in 1958 and the last surviving Saronpasu Pharmaceutical Company of women’s industrial baseball league ceased to exist in 1971. In those days, there was no opportunity for women players to become coaches and had to leave baseball. Not Takahashi. She carried on baseball at men’s clubs or coaching at batting practice ranges, and started her “Northern Lights in 1992 and scouted Mizuki. Currently, there are 23 member including 10 women in the team.